Home / Posts Tagged "36th ulster"
At the start of 1917, both the 16th (Irish) and 36th (Ulster) divisions were part of IX Corps in the British Second Army, commanded by General Plumer. The year 1916 had seen two of the three Kitchener divisions raised in Ireland taking hammerings in the Battle of the Somme and other engagements on the Western Front. Following the heavy losses, consideration was given to amalgamating the 16th (Irish) and 36th (Ulster) divisions due, in part, to insufficient reserves and a drop-off in enlistment in Ireland. There were political and military objections to this move and it was abandoned. However, the divisions still had to be brought up to strength and this was achieved by drafting in men from, primarily, English regiments and both divisions received companies from the Channel Isles, segregated, of course! 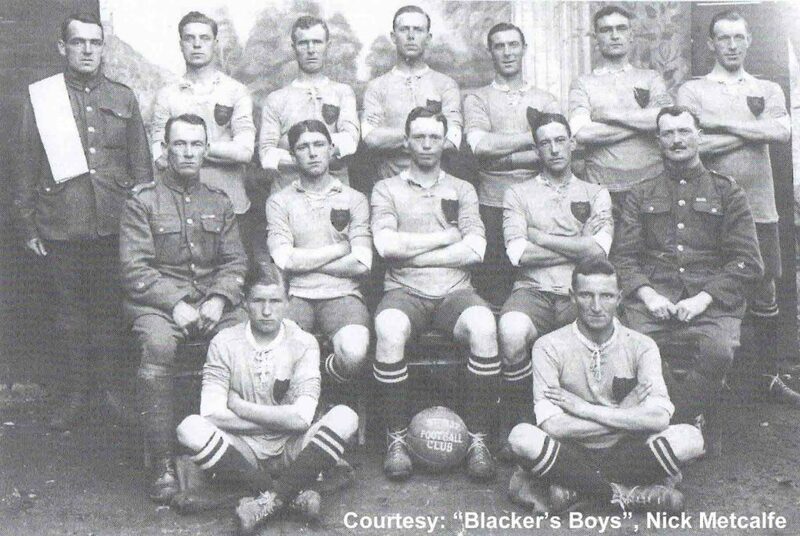 Football matches were played throughout the war and the team from 9th Battalion Royal Irish Fusiliers had a particularly fine record – they played 39 games, winning 30, scoring 137 goals and conceding 26. On 25th April 1917, they defeated the team from 6th Connaught Rangers by 2 goals to nil, following that victory with 5 nil wins over the 9th Royal Inniskilling Fusiliers on 5th May and the 7th/8th Royal Irish Fusiliers on 12th May 1917. A newspaper report on one of the inter-divisional matches recorded one wag from the 9th as saying “I wonder whether we will be disciplined for fraternising with the enemy”. This was an allusion to the political origins of the two divisions … they probably kicked lumps out of each other during the games, but a few weeks later they would be on the same side taking lumps out of the German Army! 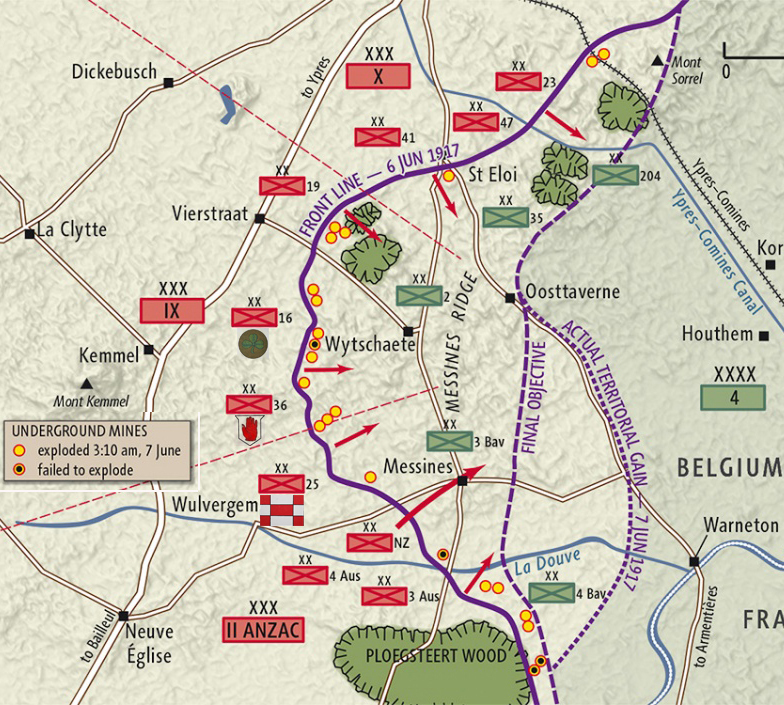 The Battle of Messines (7th to 14th June 1917) was a brilliantly planned and executed attack that resulted in the capture of the Wytschaete-Messines ridge south of Ypres, a feature that had given the British problems since 1914 and which was important to hold for future offensive operations in Flanders. It was one of the few successful stand-alone battles of the Great War. As usual, the battle was preceded by several days of heavy bombardments and the detonating of 22 mines under German trenches – four of mines failed to detonate, one in the ground over which the 16th (Irish) Division was to attack. IX Corps attacked the ridge over a frontage of 6,400 yards, with the 16th (Irish) Division in the centre and flanked by the 19th (Western) Division on their left and the 36th (Ulster) Division on their right. 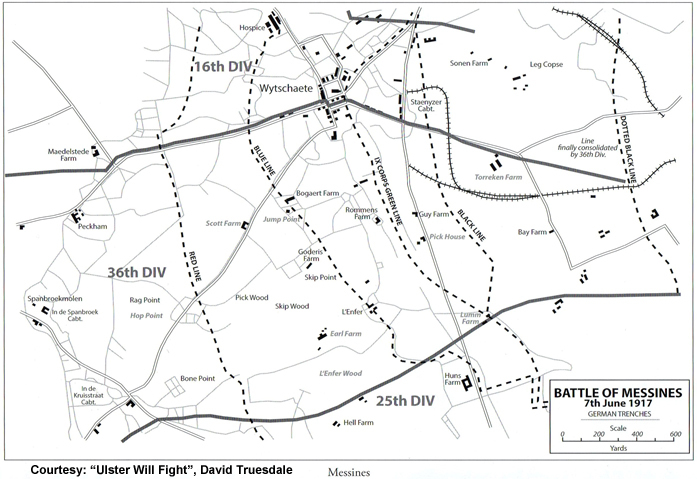 The 16th and 36th divisions captured the town of Wytschaete and the final consolidated line was, in places, 1000 yards beyond their final objectives – the “Black Line” from Lumm Farm on the map. Private Jack Christie from the Shankill area of Belfast, who had been a member of the UVF, was a stretcher bearer and said this of his comrades in the 16th division, “We should not allow politics to blind us to the truth about things, bravery and loyalty is not all on one side. We had the greatest respect for the 16th, except for the odd hardliner, but great regard for the 16th”. Another stretcher-bearer from the Ulster Division demonstrated that political allegiance had no place on the battlefield. 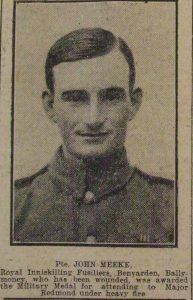 Private John Meeke of the 11th Royal Inniskilling Fusiliers was awarded the Military Medal for rescuing Major Willie Redmond of the 16th Division – the Nationalist MP for East Clare, a member of Irish Volunteers and the brother of John Redmond, the leader of the Irish Parliamentary Party. Private Meeke, who had enlisted on 11th March 1916, was searching the battlefield for the wounded when he happened to see Major Redmond fall. Despite heavy machine-gun and artillery fire, Meeke made his way to Redmond’s position to render assistance, taking shelter in shell holes and other cover on the way. He arrived at the Major’s side without injury, and found him seriously wounded in the left knee and right arm at the elbow and weak from loss of blood. Meeke had one of the wounds dressed, and was working at the other, when a piece of shrapnel struck him on the left side, inflicting a serious wound. He was hit a second time but this did not deter him from his work, which he completed despite his injury. 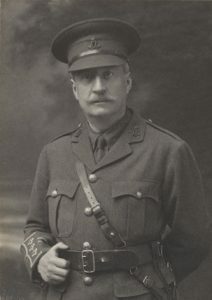 Meeke disobeyed a direct order from Major Redmond to leave him and struggled across the battlefield with his charge until he met up with Lieutenant Charles Paul and a party from the 11th Royal Irish Rifles who were escorting German prisoners to the rear. Together they got Major Redmond to the casualty clearing station located in the Catholic Hospice at Locre but he died later that afternoon. John Meeke’s brother, Samuel, died of acute pulmonary tuberculosis on 19th January 1919, a fortnight after arriving home, and his grave in Derrykeighan Old Graveyard is marked by a Commonwealth War Graves Commission headstone. 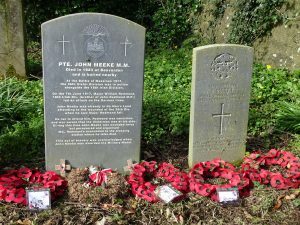 John Meeke was discharged due to wounds on 23rd June 1919, aged 25, with Silver War Badge number 506596 and died on 7th December 1923, being buried close to Samuel, whose headstone records John’s death. More recently, a public subscription organised by Robert Thompson resulted in the erection of a headstone to record details of John Meeke’s act of heroism. Whilst it is always difficult to accurately determine fatalities for a particular engagement or battle, the following are details of fatalities between 7th and 14th June 1917 where the men are buried or memorialised in Belgium. It does not include men who died of wounds in the days and weeks after the end of the battle and, whilst there were also men who died of wounds in France during the period of the battle (for example Second Lieutenant Brian Boyd MM of the 14th Royal Irish Rifles), they have not been included as it is not always possible to identify whether the wounds were incurred during the battle or preceding the battle. British forces incurred 3,835 fatalities during the period of the battle, of which 383 (or 10%) came from the eight Irish infantry regiments, and Dominion forces suffered 2,075 fatalities. There would, undoubtedly, have been Irishmen and Ulstermen who died with the Dominion forces and with non-Irish regiments in the British Army. Of the 383 fatalities from the Irish infantry regiments, 144 were from the 16th Division, 186 from the 36th Division, with the remaining 53 being from regular battalions of the Leinster Regiment (24th Division) and Royal Irish Rifles (25th Division). For the 16th Division fatalities, 24 men were born in the province of Ulster, 56 were born in Great Britain, Guernsey and Malta, and 64 were born in other parts of Ireland – 39% of the fatalities were not born in Ireland. For the 36th Division fatalities, 103 men were born in the province of Ulster, 66 were born in Great Britain, two were born in the United States of America, and 15 were born in other parts of Ireland – 36% of the fatalities were not born in Ulster. For the 24th and 25th divisions, 15 men were born in the province of Ulster, 22 were born in other parts of Ireland, and 16 were born in Great Britain – 30% of the fatalities were not born in Ireland. *Fatality statistics based on data held on the Commonwealth War Graves Commission and Soldiers Died in the Great War databases. By Nigel Henderson, History Hub Ulster member.